Part of our quick business card series, the Meta template is both an elegant and trendy design that can be ready in 3-5 business days. This makes it a viable option for those who are in need of fast quality, and would be an ideal option for companies involved in the designer industry – though the simplicity of the layout means it can be universally applied to a number of businesses. The minimalist design keeps the composition simple yet impactful and allows your work to speak for itself. 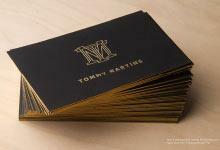 This card comes pre-etched with a modern geometric pattern and uses laser engraving on our 0.5mm black metal stock. Flaunting a sharp and clear-cut design, this template places the focus solely on your company’s professional standards and expert skills for recipients.